Having not ruined anything in a while, science has stepped up to inform you that the seemingly indestructible, impossibly advanced technology-wielding superhero known as Batman performs feats that are somewhat less than factually accurate, just in case you were enjoying them with your ignorance. 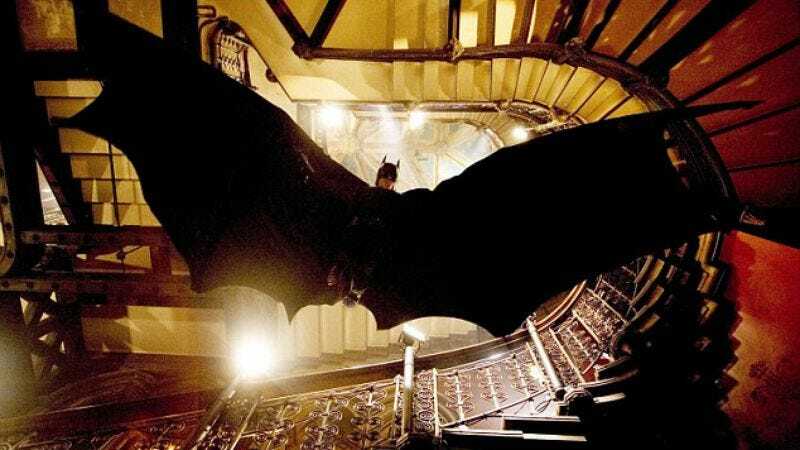 The Telegraph reports on a group of University of Leicester students who recently published a paper called "Trajectory Of A Falling Batman," in which they calculated that the 15-foot wingspan of Batman's cape would allow him to glide from the top of a 492-foot building for about 1148 feet, but that his velocity would then increase to around 50 mph as he tried to land, likely leaving him "a bit splattered." In their very scientific, killjoy opinion, they concluded that Batman needs a much wider cape, or should consider taking a parachute to counteract all the stupid, boring laws of physics. "Uh, excuse me, but Batman's cape is made from an electrically charged 'memory cloth' by Lucius Fox, which allows it to become rigid and function similar to a hang glider, so your numbers are probably skewed," millions of nerds said, pushing up their glasses. "Uh, actually, we factored that 'memory cloth' into our calculations," these other nerds said, pushing their own glasses up even higher until they became lodged in their frontal lobes, enabling them to stop talking about science stuff and just enjoy Batman.